Troxell Communications has announced the winner of its “20 20 20” Interactive Classroom Technology Sweepstakes. 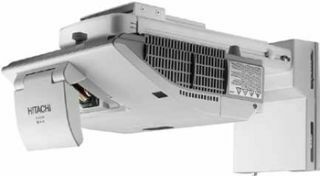 Paul Turnbull Superintendent of Santa Ynez Valley Union High School District is the lucky winner of 20 Hitachi iPJ-AW250N Interactive Projectors, 20 mounts and free installation of the products. The prizes are equivalent to $44,780.00 in retail value. The iPJ-AW250N is Hitachi’s first-ever interactive projector and has all the functionality of an interactive whiteboard built into it, eliminating the need for additional hardware. Designed for easy setup even in rooms where space is limited, the iPJ-AW250N features an ultra-shortthrow lens that enables it to be mounted close to a wall or projection surface. This prevents obstructed images and shadows, with no light shining in the presenter’s eyes. The user can write, draw, and manipulate and resize projected images by using Hitachi’s pen-sized Interactive Control. A remote control is also included. “We are extremely excited to receive this outstanding prize. The 20 Hitachi projectors will directly support our strategic planning goal of infusing 21st century technology into our classrooms, and our teachers and students will immediately benefit from this tremendous gift!” Said Paul Turnbull. Thank you Troxell and Hitachi!” said Mark Swanitz, Principal of Santa Ynez Valley Union High School. For more information about Hitachi’s new iPJ-AW250N, visit http://connections.trox.com/hitachi-demo-request/ and register for you demo today!